This Creamy Coconut Rice recipe is full of delicious, creamy coconut flavor. It’s a great side dish option to serve with all types of meats and flavors. You won’t believe how easy this recipe is to make! This recipe was inspired by my love of all things coconut. I decided to attempt to make coconut rice with nothing more than rice, water, and a can of coconut milk to see how it would turn out. I had no idea that a recipe so simple could really work. Most other coconut rice recipes seem to include quite a few more ingredients. It turns out that it doesn’t take much to make the most perfect, most creamiest coconut rice after all. After a little trial and error, I have found that full fat coconut milk gives the most coconut flavor and creaminess to the recipe. 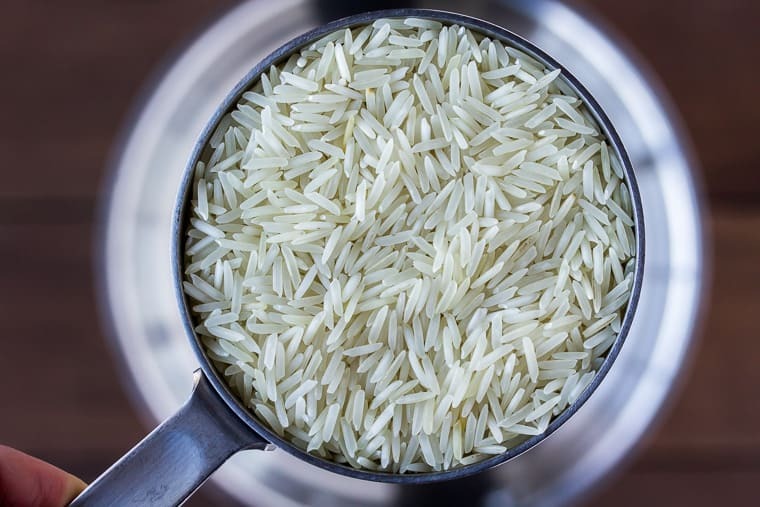 While most varieties of rice will work, jasmine or basmati are the best choices. You make Creamy Coconut Rice almost the exact same way you make regular rice. This is a simple recipe with just 3 ingredients. 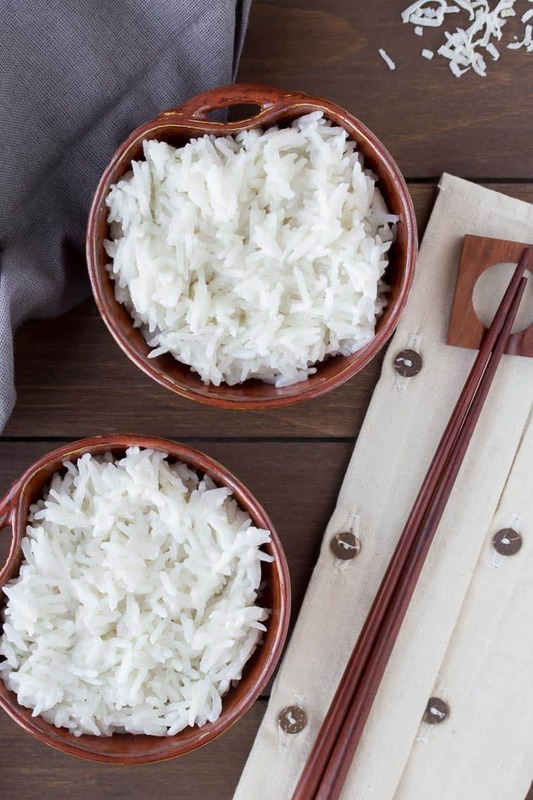 Coconut rice pairs well with a huge variety of foods, from simple to very flavorful options. The rice is creamy and loaded with coconut flavor! If you love coconut, you will love this recipe! There really isn’t much to this recipe at all. All you need is rice, a can of coconut milk, a little water, and a pot! Add the rice, coconut milk, and water to a medium sauce pan over high heat. Bring the rice to a boil, then cover and lower the heat to simmer. Stir the rice often to prevent it from sticking to the bottom of the pan. Continue to cook until the liquid is mostly absorbed, but still a little creamy, and the rice is tender. This typically takes 25-30 minutes. Note: The rice may take a little longer to cook than normal, especially if brown rice is used instead. I don’t usually garnish this Creamy Coconut Rice, as I often serve it as the base for the main dish. If you wanted to, you could top it with some toasted coconut, spices, or nuts. 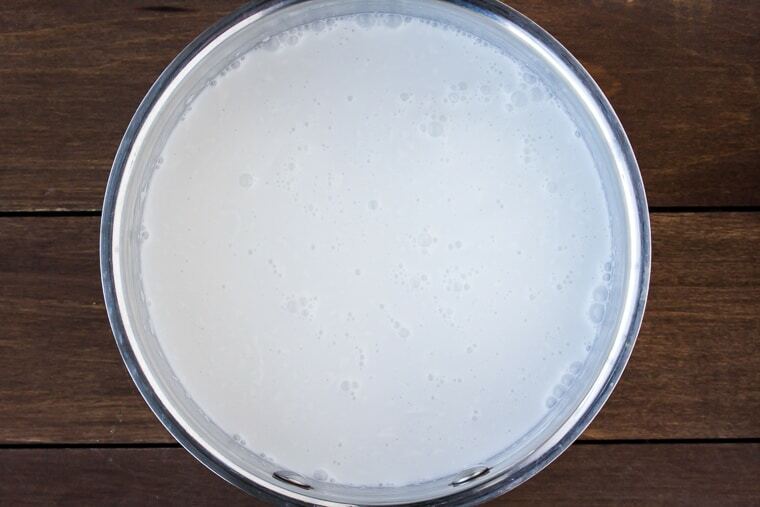 Use full fat coconut milk for the best, more flavorful results. Of the few brands of coconut milk that I have tried, I have had the best results with the Thai Kitchens brand unsweetened, full fat coconut milk. You can substitute brown rice, but it may take slightly longer to cook. Be sure to stir the rice frequently, as it is more likely to stick to the bottom of the pan than plain rice. 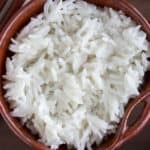 What type of rice should you use to make coconut rice? 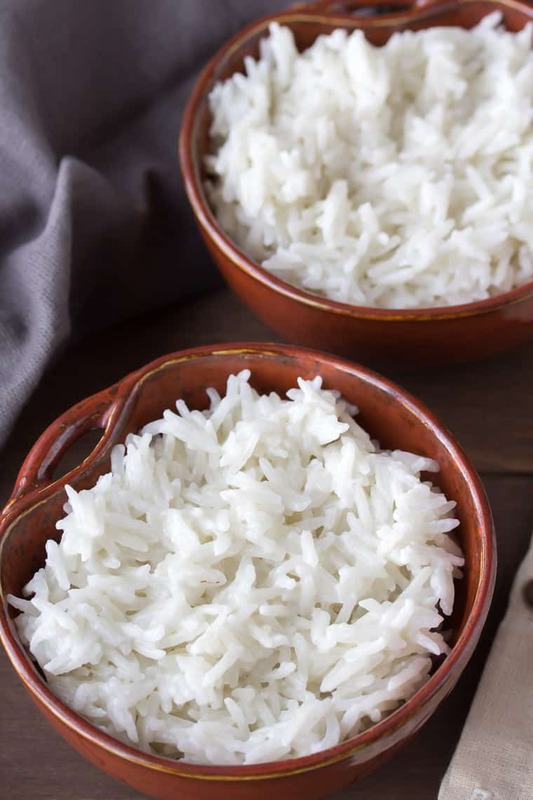 Jasmine rice is the most popular choice of rice to make coconut rice with. I also love the results that I get with basmati rice, as well. Can you freeze coconut rice? Yes, you can freeze coconut rice and either thaw and reheat or reheat straight from frozen. You may need to add a little water if the reheated rice is too dry. Is coconut rice gluten free? Yes, this recipe for coconut rice is gluten free. 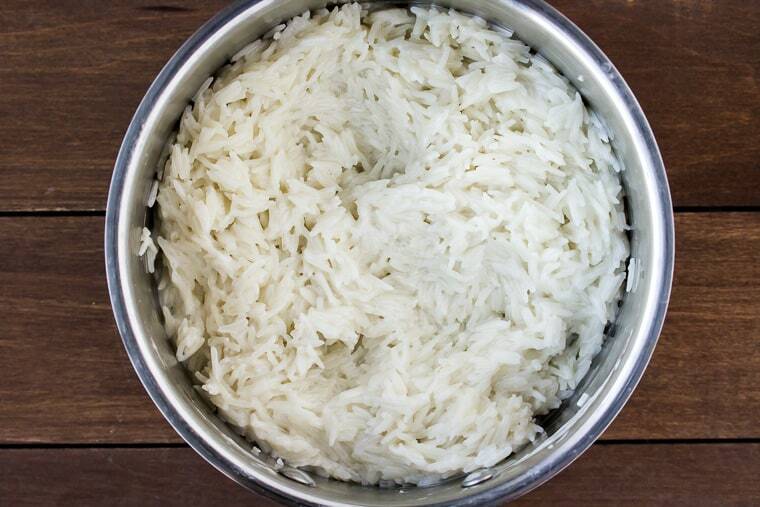 What do you serve with coconut rice? Coconut rice pairs well with so many things! You can serve it with a simple seared chicken or a flavorful Thai, Indian, or Caribbean-inspired recipe. My personal favorite meal to serve with Creamy Coconut Rice is Cuban Pork and Sweet Fried Plantains. Love this Creamy Coconut Rice recipe? Follow me on Pinterest, Instagram, and Facebook for more! This Creamy Coconut Rice recipe is full of delicious coconut flavor and you won't believe how easy the recipe is! Bring the rice to a boil, stirring often, then cover and lower the heat to simmer. Continue to cook until the liquid is mostly absorbed, but still a little creamy, and the rice is tender. This can take 20-30 minutes, depending on the type of rice used. This recipe was originally published on March 30, 2016. The images and text were updated in February 2019 to include cooking tips, frequently asked questions, and a video of the recipe being made.